A dramatic story of courage and betrayal and of a determined young woman's search for her brother and her discovery of an all-consuming love in the shifting deserts of Egypt. Kate Furnivall was raised in Penarth, a small seaside town in Wales. Her mother, whose own childhood was spent in Russia, China and India, discovered at an early age that the world around us is so volatile, that the only things of true value are those inside your head and your heart. These values Kate explores in The Russian Concubine. Kate went to London University where she studied English and from there she went into publishing, writing material for a series of books on the canals of Britain. Then into advertising where she met her future husband, Norman. She travelled widely, giving her an insight into how different cultures function which was to prove invaluable when writing The Russian Concubine. It was when her mother died in 2000 that Kate decided to write a book inspired by her mother's story. The Russian Concubine contains fictional characters and events, but Kate made use of the extraordinary situation that was her mother's childhood experience - that of two White Russian refugees, a mother and daughter, stuck without money or papers in an International Settlement in China. 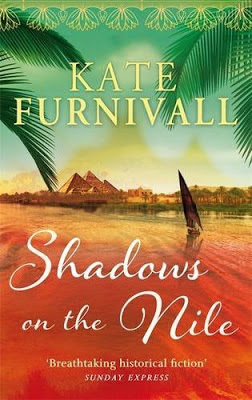 Other books by Kate Furnivall: The Russian Concubine, The Red Scarf, The Girl from Junchow, The Jewel of St. Petersburg and The White Pearl. As a fan of her work I will be more than happy to add this title to my list. Thank you for sharing an interesting post! Your son looks so happy. Great photos! This book and author sound so interesting, I can't wait to read her book. I love books about Ancient Egypt. This sounds interesting, also!